Hello! I do not normally like to show my craft room as it is organized for me but is also rather cluttered at the same time. About six months ago, I ended up having to move my craft room to make room for my mom to move in. 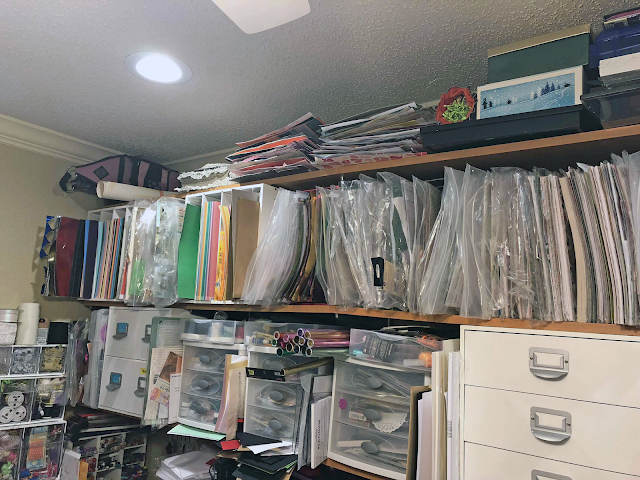 So we turned the front dining room which is much smaller than my old craft room into my craft room and my old craft room became my daughter's bedroom. The fact of the matter is that I just have waaaayyy toooooo much stuff so moving into a smaller room has been challenging! 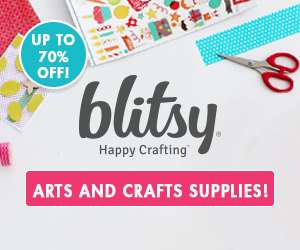 I guess I am kinda a hoarder when it comes to my craft supplies, but aren't most of us? So I thought I would share some of the ways I "try" to keep myself organized even though it is not a pretty craft room like so many others are. 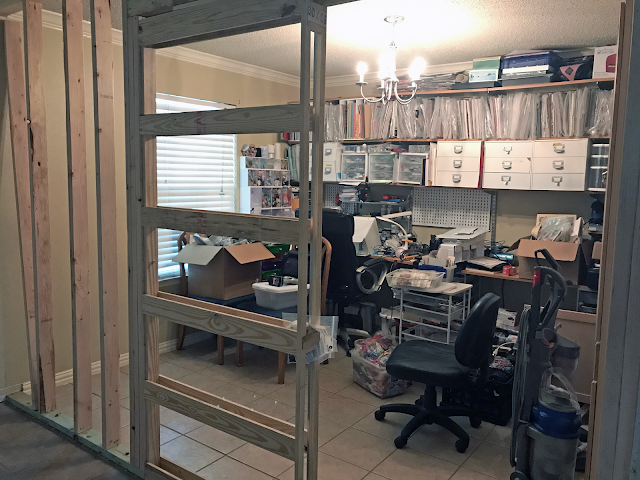 Here a quick photo of what it looked like when I was trying to get my new craft room organized while they were building the new wall with a pocket door. The chandelier was taken out and replaced with a fanlight and some recessed lighting was also added. 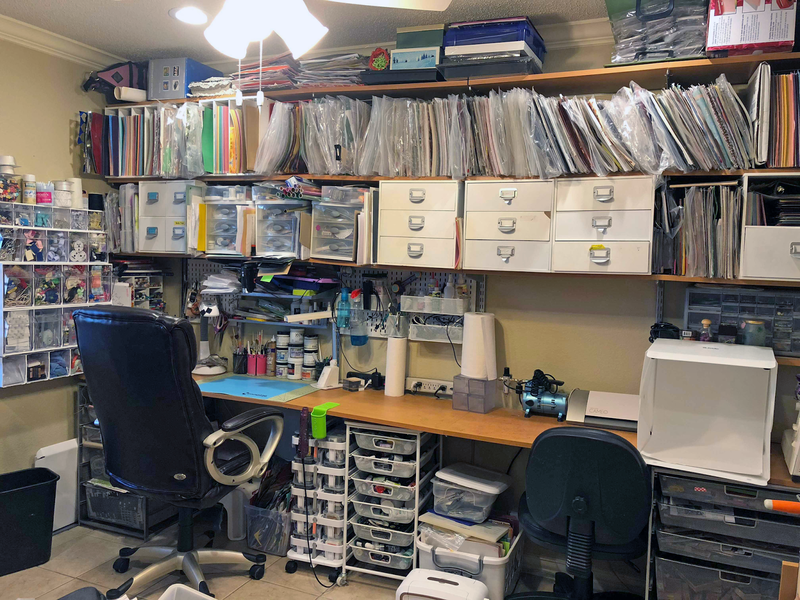 All those bags on the shelves are paper collections and kits and my shelves and desk are from the Container Store. 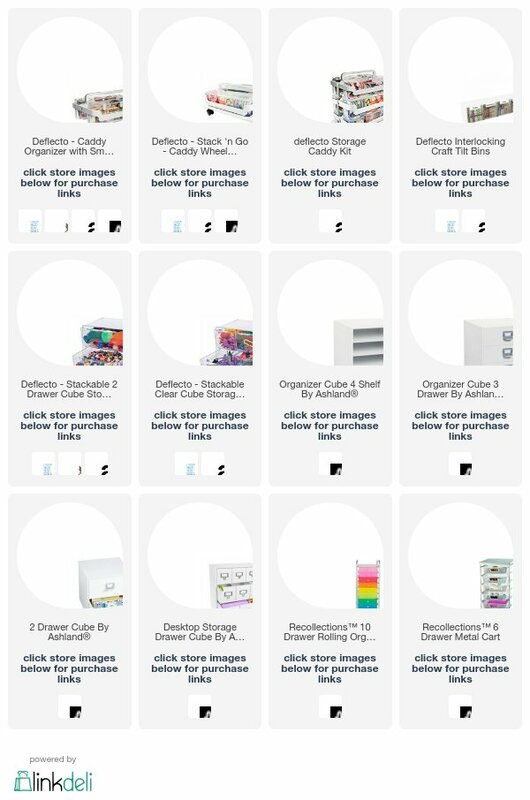 The white boxes are from Michaels. 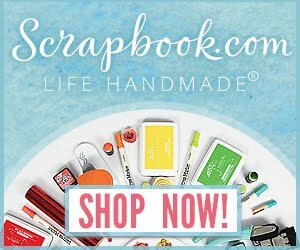 I am one of those crafters that I like to have things in sight and nearby because once it is out of sight it is out of mind and does not get used. 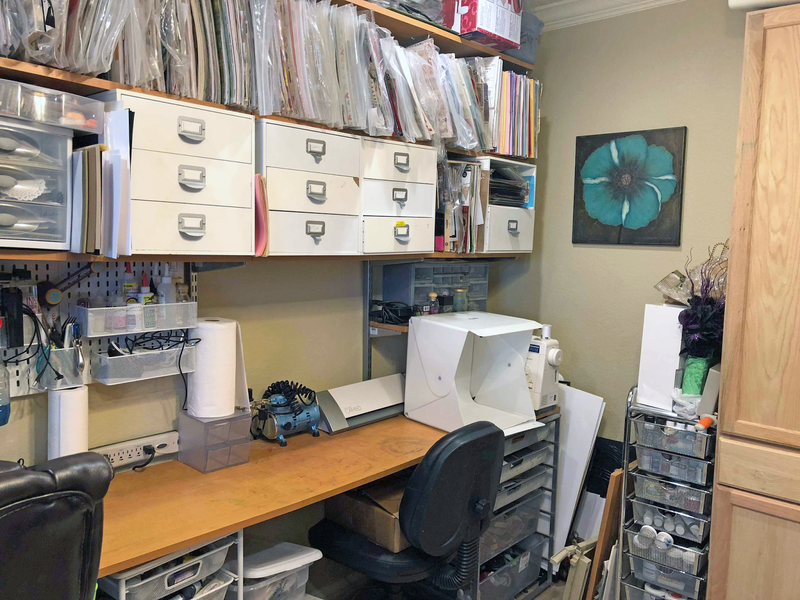 So I use a lot of clear and metal mesh drawers. 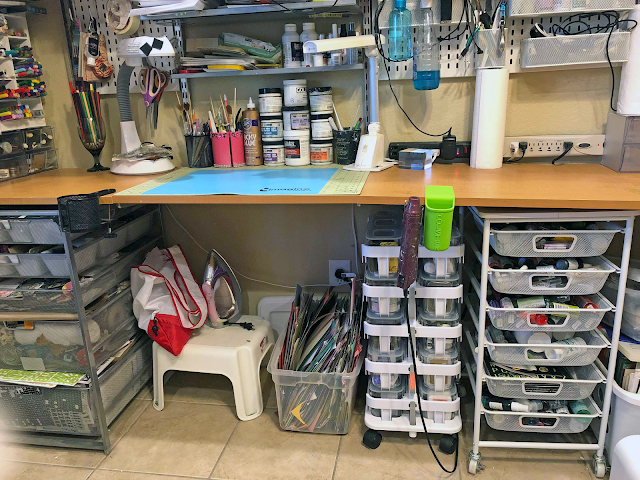 One of my favorite organizers that I have nearby my main crafting area is the Deflecto Craft Tilt Bin. I have them in all sizes! 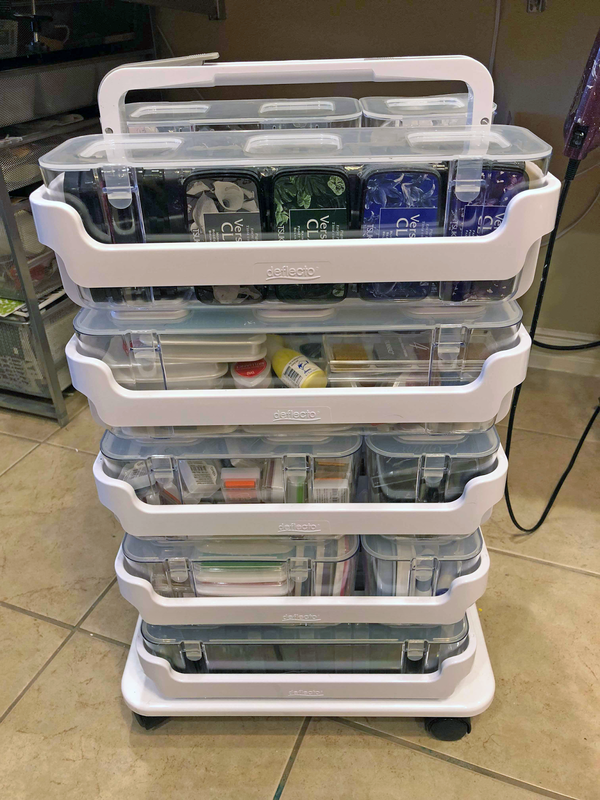 Below is a video I did showing how awesome these Deflecto Craft Tilt Bins are. 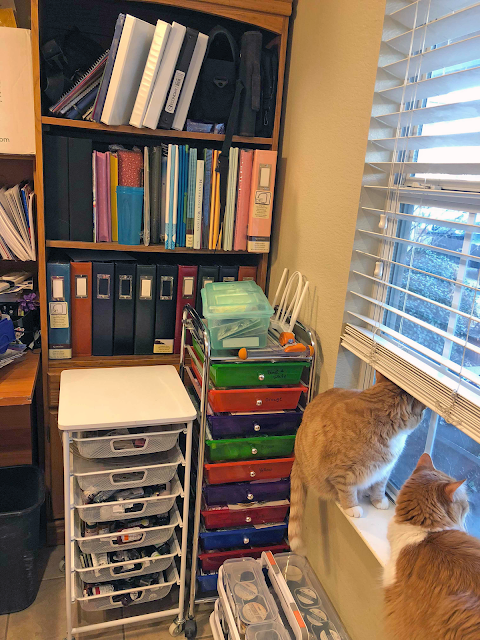 On top of my workspace, I have some Deflecto Stackable Cube Organizers with 2 Drawers and 4 Drawers. These work great to have those items I use regularly close by. My next favorite organizer is my Deflecto Stackable Caddies and the Stack n' Go Wheel Base. This is such an awesome system! I love how it can be rolled around and how each caddy can be taken off and brought to where I need it. The caddies fit perfectly under my workspace when not in use. 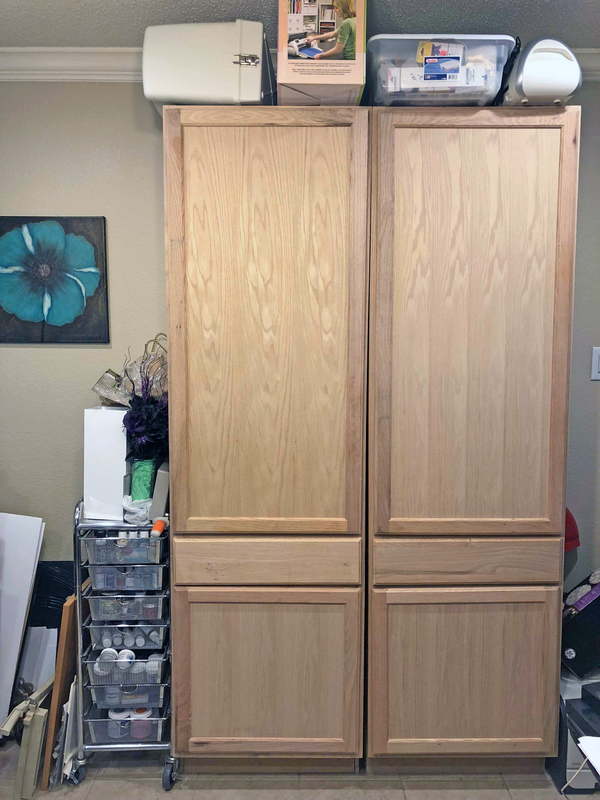 For the items I do not use as often I have these two big wood pantries. 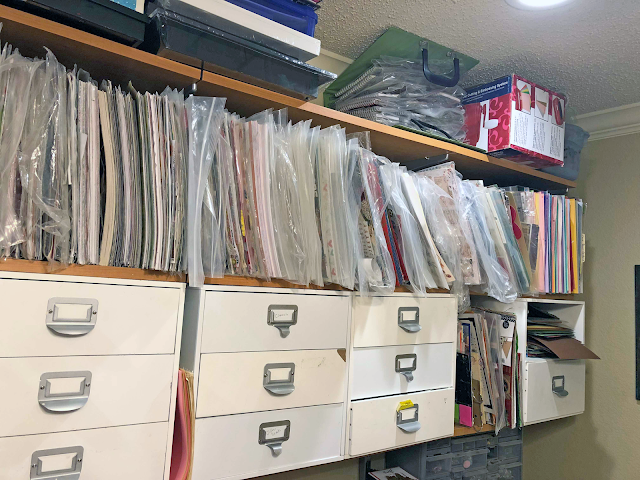 Next to his desk though I have an old bookcase that I use to store all my scrapbook albums on. I really need to actually start putting my layouts into those albums. In front of the bookcase, I have some more rollabouts. 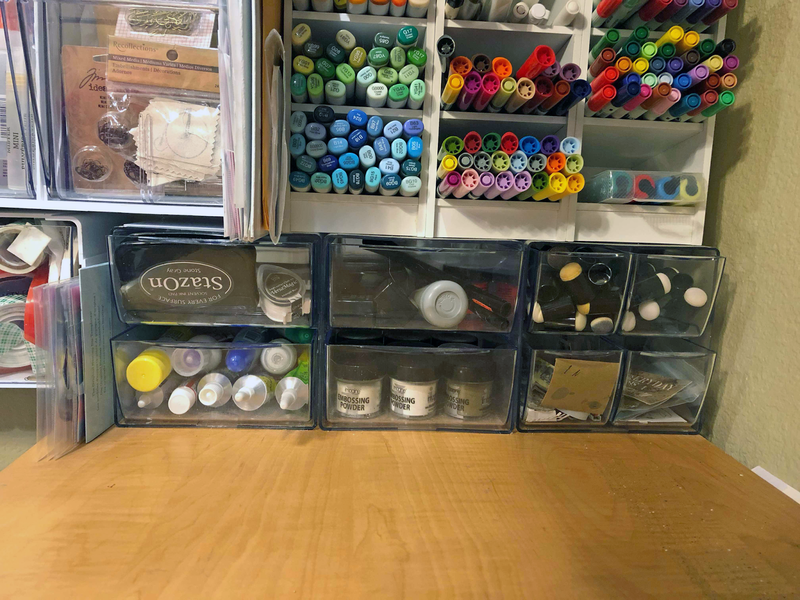 The one with the color drawers is where I keep all my flowers, I organize them by color in each drawer. My two crafty sidekicks are in the window enjoying the sun. 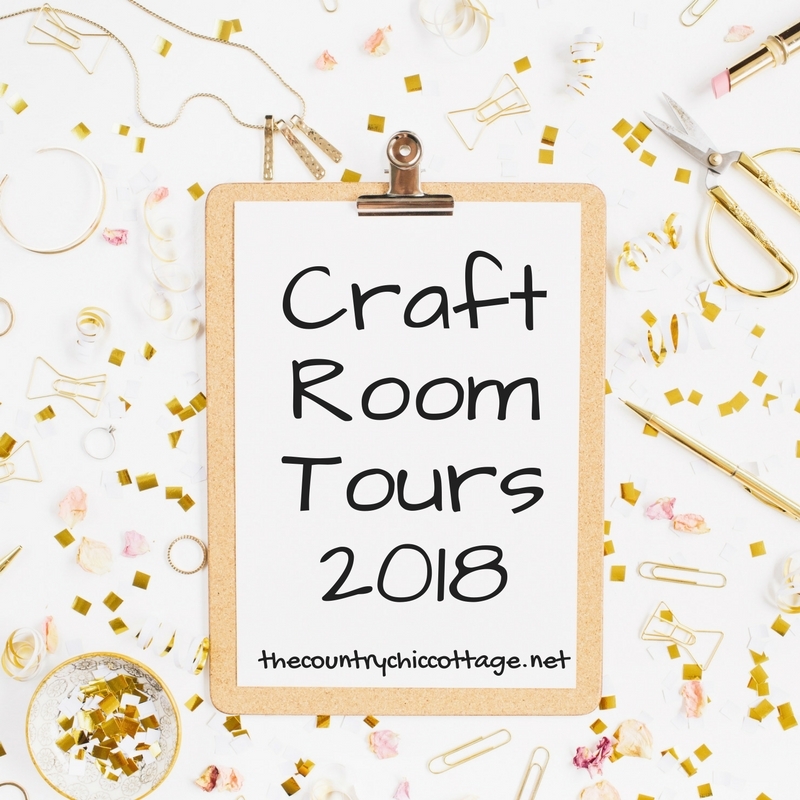 I hope you enjoyed this little tour of my craft room. 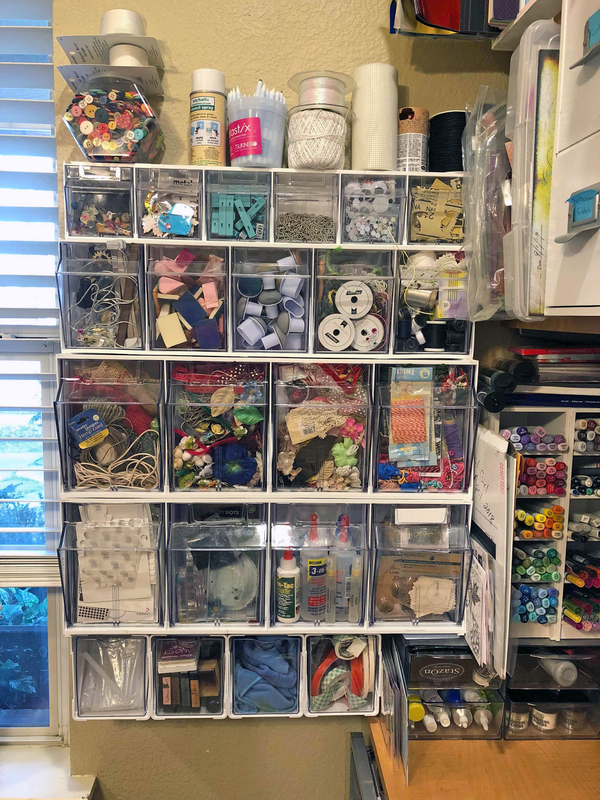 Hopefully, you got some craft room organization ideas that you can use for yourself as well. Now, are you ready for some more great craft rooms?